The UK not only needs to build many more and better homes, but also to build communities that last. URBED would like to invite members of the Sustainable Urban Neighbourhoods Network to visit Graylingwell Park in Chichester, hosted by Galliford Try, which is one of the best examples of saving energy. The day comprises of two sessions and it would be great if you are able to attend both. If you are only available for only one session that is fine too. Please contact Jess Bousie j.bousie@urbed.com if you are interested. 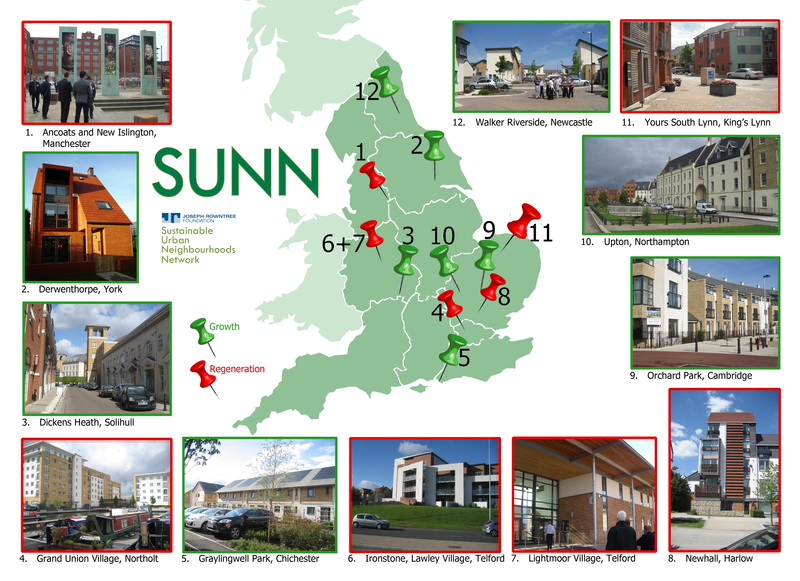 The SUNN network may have come to its end with the launch of its findings in February this year but the conclusions and lessons learnt continue to be shared around the U.K.
Members from the SUNN network came to York on 20 June 2012 to see the impressive progress made at Derwenthorpe. The new village is designed to use much less energy, thanks to a ‘heat engine’, and the homes are selling for a premium. Nicholas Falk has presented findings from SUNN at a number of well attended disemination events. The first was the annual conference of the Birmingham Architecture Centre MADE on 26th June which provided a chance of meeting up with designers in the Midlands. Birmingham City has adopted a policy of promoting sustainable urban neighbourhoods on a major scale. On 12 July 2012 Nicholas was invited to discuss the conclusions at the Department of Communities and Local Government, which is working on a new policy for large or strategic housing sites. There was particular interest in the lessons from the Netherlands, including the funding of advance infrastructure and the role that custom built housing can play in making housing more affordable. A copy of the presentation can be viewed on this page. The third and final dissemination talk where Nicholas will discuss SUNN will be at the Urban Design Group’s Annual Conference in Oxford on October 20th. Lessons from SUNN will continue to be discussed at a conference on Garden Cities in Northampton, one of the Growth Areas, on 18 December 2012. 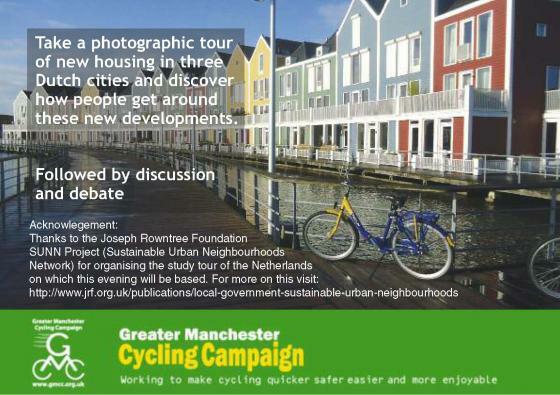 Greater Manchester Cycling Campaign hosts a special presentation. Take a photographic tour of new housing in three Dutch cities and discover how people get around these new developments. Followed by discussion and debate. “So just how good is cycling in the Netherlands? Last year, I got the chance to find out for myself. I was privileged to join a study tour of new housing in three Dutch cities, organised by the Joseph Rowntree Foundation SUNN Project. In the Netherlands we viewed three cities: Amersfoort, Houten and Almere. The new homes we saw have many different designs and sizes. The bicycle is frequently the best way to get around - the quickest and most direct route between A and B, the most pleasant way to travel (traffic-free). Proper cycle storage, hire and maintenance facilities abound. This leaves public transport - mainly rail - to take you longer distances (e.g. to work).Despite high quality building standards, low energy consumption homes, pleasant surroundings and significant transport infrastructure investment, the finances work. Public subsidy is minimal, yet these developments are financially successful. The final reports from the Sustainable Urban Neighbourhoods Network were launched at the RICS to a packed audience on Tuesday 21 February 2012, and the recommendations were well received. You can obtain both the full research report and the shorter Solutions paper, which is aimed at local authorities, by going into Nicholas Falk’s blog. There will be at least six dissemination events to follow the launch given my Michael Carley and Dr Nicholas Falk. The first of these events will be the RTPI Urban Design Forum on March 9 in Birmingham, followed by the Northern Housing Consortium - Housing and Economic Development Conference on March 23 in York. Watch this blog for notification of further events. SUNN’s regular day-long field meetings and guided walks continued in 2011 with meetings in Manchester (Ancoats and New Islington) 28 June 2011, London (Grand Union Village) 27 September 2011 and Netherlands Study Tour (Vathorst, Houten and Almere Poort) 6-7 October 2011. Grand Union Village, London highlighted particular interest in how a village was managed, and the role and funding of the CDT. Major concerns were raised over how the resident mix had changed since the development was planned, mainly an unexpectedly large number of ‘buy-to-let’ rented flats, and problems with parking provision, which seem to afflict every new development within SUNN. There were also issues over how developments should relate to the surrounding open space, and how character can be developed and maintained when densities are quite high. New Islington, Manchester provided a meeting with a main focus on environmental sustainability, balanced communities, and cutting edge public realm initiatives. The lessons on ‘what works’ include: Effective partnership working between the landowner, master developer and other public agencies including the HCA, New East Manchester Ltd and Great Places; A masterplan that makes the most of existing and new canals, thus reflecting the area’s history, with a new park acting as a buffer between the housing and an existing, unattractive retail park; Reuse and recycling of both buildings and materials; A design code which secures higher standards than would normally have been achieved. Some things which did not work so well included: Some new technologies, such as private wire networks; Complex household energy bills/service charges; The financial case for water technologies, such as grey water recycling. Vathorst, Houten and Almere Poort, Netherlands were three quite different places, one involved the extension of a historic city (like Cambridge or York), another was a new suburb a few miles from a major city (like Dickens Heath or Telford), and the third was the final part of a major new town (like Milton Keynes). They exemplify the way new neighbourhoods are being designed to be truly sustainable and happen to be close together. Though the Netherlands is smaller and more cohesive than the UK there are also many similarities, including most people living in relatively dense towns and cities that are close to each other. The cities face the challenges of living in a global economy which is running out of natural resources, with people who come from different backgrounds. It was clear that the Netherlands is much less class-conscious, and that most people behave in a more collective or less individualistic way, for example preferring to cycle rather than show-off their cars. Research has shown that children are much happier, and there are much lower levels of social malaise such as teenage pregnancy or drug dependency. SUNN’s regular day-long field meetings involved discussions and a guided walk around the site of the meeting. By the conclusion of 2010 meetings had been held in Cambridge (Orchard Park) 15 March 2010, Solihull (Dickens Heath) 12 April 2010, Newcastle (Walker Riverside) 21 June 2010 and Telford (Ironstone Lawley and Lightmoor) 21 October 2010. Each of these meetings produced a report based on the day’s events and conclusions drawn (downloadable from this blog). By June 2011 SUNN members had seen and learnt a lot and an interim report was launched to summarise the interim findings, drawing on SUNN’s workshops and field visits (downloadable from this blog). The report outlined 2011 meetings planned in Manchester (Ancoats and New Islington), London (Grand Union Village, Northolt) and a Dutch Study Tour (Vathorst, Houten and Almere). Orchard Park, Cambridge, a development of one of the first planned urban extensions, on the edge of Cambridge’s main council estates and the route of the guided bus, was threatened by builders withdrawing, leaving it looking like ‘Beirut’ according to a journalist. Thanks to co-operation between South Cambridgeshire District Council and subregional partnership Cambridgeshire Horizons with support from registered social landlords (RSLs), action was taken to rebuild confidence, and a vibrant new community, with an active Parish Council, has emerged. Cambridgeshire Horizons links adjacent local authorities and other key players in promoting local development. This confirms the importance of supporting neighbourhood planning at the local authority and sub-regional levels. Dickens Heath, Solihull is a new settlement in the Green Belt of a prosperous area where high standards of architecture were demanded and were financially viable. It showed the real value of sustained local authority leadership over the entire development period of a decade and more, and the great benefit of an active Parish Council. If more new housing schemes were of the quality of Dickens Heath there might be much less local opposition. However, the scheme did raise real questions about the costs and benefits of providing more of a social mix, and of achieving similar quality in areas with lower property values. It also demonstrated, even with best of intentions, the difficulty of achieving retail vitality in a new but traditional high street environment at the centre of the development. Walker Riverside, Newcastle, in the city’s East End is one of a number of community regeneration schemes aimed at rebalancing the local economy and population. Attractive, affordable new housing and new open spaces are changing the area’s image and creating a mixed-income community close to the city centre, thus reducing transport costs and emissions. The revitalisation of their neighbourhood in a participatory framework is also empowering long-standing existing residents dismayed by decline. However, progress has been disrupted by the withdrawal of funding for regeneration, infrastructure improvement and housing association grant, which puts previous investments at risk and undermines a long-term regeneration process. Ironstone Management Services, Telford is an innovative agreement between Bournville Village Trust, Sanctuary Housing Association, and the Ironstone consortium means that all new residents receive a high level of estate services for a charge of £250 pa. This gives rise to high quality, well-managed public spaces, whatever the tenure and is helping to build a sense of community. Neighbourhood Watch, and TV/radio provision for all, has been put in place from the beginning. In sponsoring SUNN for two years, following a feasibility study, the Joseph Rowntree Foundation aimed to extend their interest in ‘poverty, place and empowerment’ by improving the contribution that affordable mixed new communities make towards these objectives. The launch of SUNN was held at Folk Hall, New Earswick, York on 23rd November 2009. It was a successful day event with opening comments by Chair John Hocking, JRHT Executive Director. John was followed by Julia Unwin, the Chief Executive of the Foundation and Housing Trust, who stressed that JRF wanted to ‘share what does and does not work’ in developing mixed communities. She pointed out that successful places, like New Earswick, have stood the test of time because of long-term stewardship and there should be similar aspirations for the current round of new communities. The Housing Trust’s scheme for building 540 homes in Derwenthorpe on the eastern edge of York provided an opportunity to bring Joseph Rowntree’s original vision up to date and to apply learning from other parts of the country. Dr Michael Carley and Dr Nicholas Falk then gave an introduction to SUNN. Michael Carley explained the need to raise standards in building urban extensions all over the country so sustainable urban neighbourhoods became commonplace rather than the exception. One way to change practice is through ‘learning by doing’. Nicholas Falk from URBED explained that the network might address a series of common issues of sustainability. He mentioned the six Cs of community, connectivity, climate change, character, collaboration and cash flow to stress the importance of looking at places holistically. As we often know where we want to be, but not how to get there in stages, there was to be a particular emphasis on understanding the economics of sustainable development at different stages and in different types of location.